Michael Sam and the Missouri football team were honored during Saturday's basketball game. 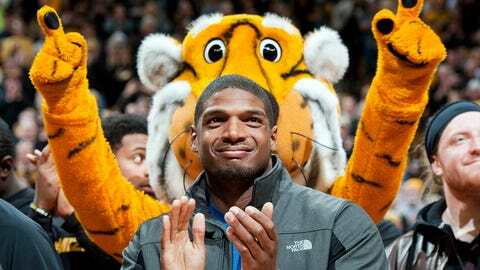 ST. LOUIS — The controversial Westboro Baptist Church used Saturday’s Missouri basketball game against Tennessee in Columbia as an opportunity to show its disapproval of Michael Sam. But the handful of protesters who gathered in Columbia to picket and denounce Sam — the former Mizzou defensive end and future NFL player who announced last Sunday that he is gay — were met with some resistance. Sam’s supporters countered with Stand With Sam, with hundreds if not thousands lining up in support of him to form a human wall along South Providence Road. As MU's student body president and an openly gay man, I proudly #StandWithSam and all members of the LGBTQ community that call Mizzou home. At least one of Sam’s former teammates, Max Copeland, was among the people who lined up to show their support. The Sam supporters broke up their wall a few minutes before the start of the basketball game. The Missouri football team, including Sam, was honored at halftime. Westboro Baptist Church called the event a "great picket!" via its Twitter account, which also aimed some messages directly at Sam.